DEARBORN, Michigan – Four Hampton University architecture students won $15,000 for their campus and place second at the fourth annual HBCU Community Challenge here Nov. 16-17. Joiana Hooks, Jonathan Legaspi, Anthony Owens and Victoria Pollard, all fourth-year students from the School of Engineering, each received iPad Minis in addition to the prize money for their project, “Adaptation to Sea Level Rise,” a proposal on a coastal community design. The proposal focused on flooding in Hampton Roads and design strategies on how to combat this reoccurring problem. Strategies included putting cisterns under parks, using water actuated or barrier walls, and using rainwater barrels to collect runoff. The project’s implementation has already begun in Chesterfield Heights, a Norfolk community. “The continuation of this project is important to us because we want to help these underserved communities, giving them solutions, hope and a longer lifespan for their communities and for their livelihoods,” said Joiana Hooks, the team captain. Grant money from Ford would go to other students in years to come, because this project is similar to a fellowship due to its rigor and consumption of time. A posting about the competition on a message board inside Beamis Laboratories on campus alerted the student to the opportunity. They took information learned in their class and submitted a proposal, which landed them in the top three for the “Building Sustainable Communities” competition. Proposals were required to focus on a topic in the realm of mobility, alternative energy, sustainability or water. Over 40 Historically Black Colleges and Universities submitted proposals, and the top three institutions that placed were invited to the Ford World Headquarters to present their proposals for the chance to win the grand prize of $75,000. Ford Motor Company worked in conjunction with the Tom Joyner and Rickey Smiley Morning Shows. 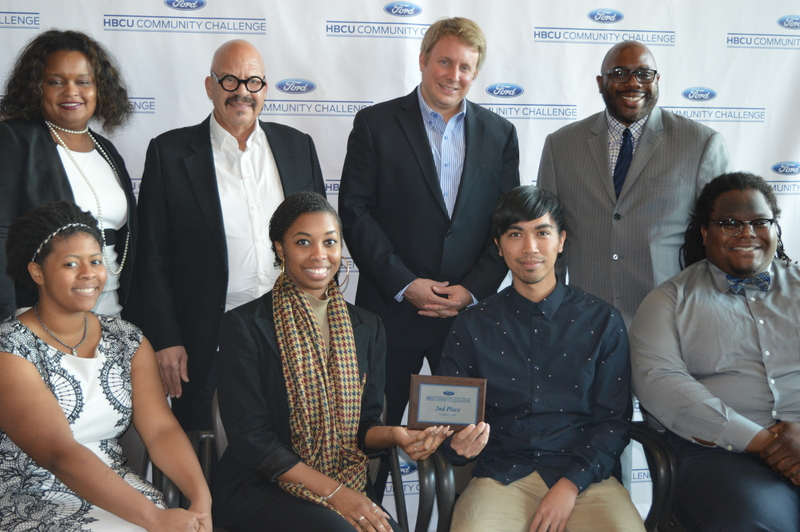 On the last day of the competition, the three finalist schools presented proposals to a panel of judges that included: Tom Joyner, radio personality, Burt Jordan, vice president of Ford Global Vehicle and Powertrain Purchasing and Supplier Diversity, Pamela Alexander, director of the Ford Fund, and Henry Ford III. The finalists completed last-minute preparations with their mentors, and then presented their proposals for a maximum of 20 minutes, followed by 10 minutes of questions from the judges. Teams were judged on their overall presentations (80 percent) and numbers from online public votes that were conducted Oct. 27 through Nov. 10 (20 percent). “I was so impressed by what I read, that I insisted on mentoring this [Hampton] team,” said Thomas Niemann, social sustainability manager at Ford. Prairie View A&M University of Texas placed first and received $75,000: $10,000 scholarships for each team member, $10,000 for their university and $25,000 for their project implementation. Hampton finished second, and John C. Smith University of Charlotte placed third and its team members received iPad Minis and $10,000 for their project implementation. Next Next post: 2016-17 College Football Playoff: Who’s in, Who’s Out?